I’m on a roll – and I’m not going to stop until I finally catch up on things that I’ve been wanting to get done. One thing I’ve been wanting to do is write up a recap of 2007. In a way, I didn’t want to review the year because it was a difficult one emotionally. But I feel better now that I’ve gone through it. So here we go! I Feel Like We Are Gettting Back on Track Again – I lost a bit of steam at the end of 2006. But a bigger payment to our debt helped to get me motivated again. This Would Be an Argument for an Emergency Fund – We started off with no emergency fund, but I’m slowly seeing the importance of one. Those Darn Bumps in the Road – Debt reduction sure is one rocky road. Smoothing Out Those Bumps in the Road – My suggestions on how to smooth out those bumps. Credit Card Debt Update $23,517 – Getting closer to $20,000! No More Green and Purple – I changed the look of the site to blue. How I Reduced My Finance Charges from $400/month to $100/month – If you can lower your finance charges, more of your payments can go towards the principal balance. It’s Time – With $122 in our savings account, it was time to beef it up. I Was an Emotional Shopper – Funny how watching a TV show can sometimes make you realize something about yourself. Reducing Debt – Where Did We Start – Going back to basics and sharing how it all began. How Far Will I Go To Pay Off Our Debt – Some people go to major extremes to pay off debt. Here’s how far I will go. Big Announcement – I’m Pregnant – Probably the happiest day of 2007. Some Very Sad News – A very heartbreaking day, and even while writing this I am getting teary-eyed. Credit Card Debt Under $21,000 – Getting even closer to $20,000. A Very Special Personal Finance Interview 6 Months Later – Kids are the greatest when you ask them questions about money. The Result of My Life Insurance Shopping – We are working to reduce debt, but we are also working to get other financial matters in order. A big part of that is getting health insurance for me and my husband. Why Did It Take So Long – We’ve been in debt quite a while. Why did it take so long to finally do something about it? Credit Card Debt Under – Our credit card debt was finally under $20,000. I’ve Created a Garage Sale Monster – During the summer we had three garage sales. My son really got into it. It’s Official – Our Debt Load Increased by $1,600 – A big setback after correcting a mistake on a prior year tax return. Operation Garage Sale – Parting With My Collection – I love bald eagles and had a huge collection. To simplify my life, I said goodbye to it. Credit Card Debt Update – $20,602 – Getting closer to $20,000…again. A Year and a Half Later – I Still Get Sick of Being in Debt – I think I feel this way at least once every couple months. A Very Somber Holiday Weekend – Another sad day when a friend was killed in an accident. I Had No Clue You Could Shift Credit Limits Around – You learn something new everyday! What To Do If a Credit Card Employee Calls You – If you ask questions, you can find out some interesting info. A Few Changes Made a Big Difference in Our Electric Bill – Little changes can sure add up. I’m 30 But Going on 40 According to My “Real Age” – That was a bit eye-opening. Downsizing Your Home to Save Money – Our home is 1100 square feet to begin with, but there’s room to downsize. Done Deal – All Of Our Credit Card Debt is at 0% – This was a great accomplishment for 2007. Five Words That Sum Up Our Debt Payoff Success – Five little words that pack a punch. The Evolution of Our Emergency Fund – I was anti-emergency fund – but now I am pro-emergency fund. This is how it evolved. Emergency Fund Update – $1,500 – We spent some time beefing up our savings. Nope – I Don’t Feel Like Thinking About Debt Today – Some days debt seems trivial. 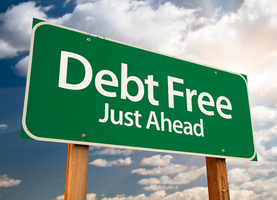 We Have Paid Off Half of Our Credit Card Debt – $18,807 was the magical halfway point in our debt reduction journey. Renting Versus Buying (On a Smaller Scale) – What would have been a simple decision before (put it on credit!) isn’t so simple anymore. Savings Account Update – $2,869 – We rounded out 2007 with a savings account balance that still amazes me. We have money in the bank! Our 2008 Financial Goals – Lastly, I made some goals for 2008. So there’s 2007 in a nutshell. For those of you who have told me they have read through my old posts…wow! That’s a lot of reading! And if you would like to check out 2006, here’s a link to that post. Coming up soon – a post highlighting my frugal posts of 2007. And I’m still working on that super-post of tips about saving money on groceries. Wow, Tricia, what a great recap of your journey so far. The best part: you’ve still got the finish left! I looked at your networth and I noticed that it’s bumped up again to where it was before the tax issues last year. So congrats!!! You’ve come a long way. I missed your pregnancy and miscarriage news last year. I’m so very sorry. I know firsthand how difficult it is to lose a pregnancy and even years later, I still get emotional about my losses. But I hope you’ll have a new baby in your life soon, or whenever you are ready. I think you’re also doing amazingly when it comes to erasing your debt, so good job!